How tall is Sabrina Carpenter? 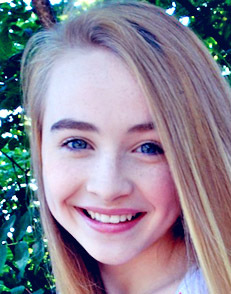 Sabrina Carpenter was born in Lehigh Valley, Pennsylvania, USA (May 11, 1999). Carpenter’s acting career began with the TV series ‘Law & Order: Special Victims Unit’ as Paula in 2011. In 2012, Carpenter’s first leading role came with the TV movie ‘Gulliver Quinn’ as Iris, and then, her first cinema movie role came with ‘Noobz’ as Brittney. Carpenter’s breakthrough role came with the TV series ‘Girl Meets World’ as Maya Hart in 2014. How much does Sabrina Carpenter weigh? Sabrina Carpenter’s weight is 88 lbs (40 kg). What are Sabrina Carpenter’s measurements? Sabrina Carpenter’s measurements are 28-22-30in (71-56-76cm). Carpenter is good friends with actress Rowan Blanchard. She has a actress sister named Sarah. Carpenter also made a studio album named Eyes Wide Open. It will probably release in April 2015 via Hollywood Records.